It’s here – one of the most unlikely partnerships in the semiconductor industry. Long-time rivals Intel and AMD, battling out of x86 dominance for over 35 years, are now co-conspirators. Take one part Intel’s high-performance 8th generation processor core, one part with AMD’s efficient Vega graphics, mix together with 4 GB of HBM memory and sprinkle in some high-performance interconnect. The new products are officially labeled as ‘Intel 8th Generation Core with Radeon RX Vega M Graphics’, although this will be shortened to ‘Intel with Radeon Graphics’ for ease of use. Intel with Radeon Graphics is strictly speaking a new Intel specific product, to be marketed and distributed as such. Today’s official launch builds on the platform announcement made late last year, with added additional specifications, confirmation of the feature set, and a series of new products based on Intel with Radeon Graphics are set to be announced this week at CES from Dell, HP, and Intel's own NUC. Aside from the NUC, we've been told to hold the other vendor information until their embargo times have arrived. 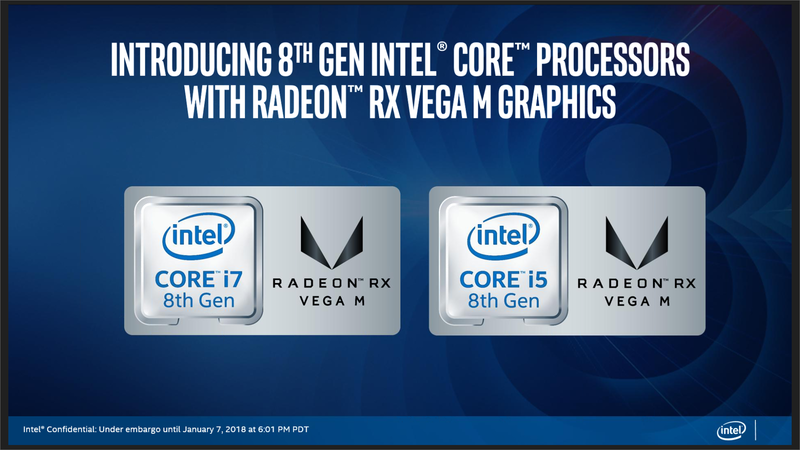 As we explained in our previous coverage, Intel with Radeon Graphics uses an ‘H-series’ Intel central processor and an AMD Radeon graphics processor as two distinct bits of silicon on the same package (a multi-chip package). 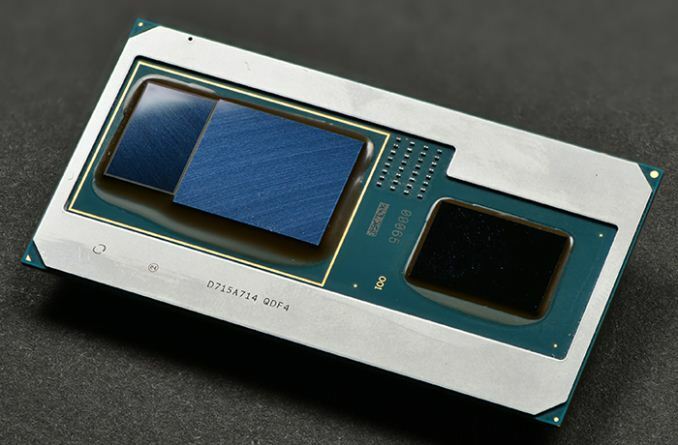 Intel is buying the graphics processor from AMD, much like any other silicon purchase, and as a result, AMD’s involvement is strictly business. The graphics processor part is designed by AMD’s semi-custom division that deals with custom designs, such as the chips that go into Sony’s PlayStation 4 and Microsoft’s Xbox line. The graphics is connected to high-bandwidth memory, specifically the second generation HBM (known as HBM2), and the connection between the two uses Intel’s new embedded multi-die interconnect bridge technology, or EMIB for short. In other words, Intel CPU + AMD GPU + HBM2 + EMIB – acronyms are ablaze with these new chips. The G-class Intel with Radeon Graphics processors being launched today are bigger than the standard processors that we would normally expect for mobile platforms, coming in with a TDP of 65W and 100W, although how power is managed between the two is part of Intel’s story with the new processors. Chipset + PCIe 200-series derivative? 14-20 PCIe 3.0 Lanes 200-series derivative? Each of the new parts is a quad-core design using HyperThreading, with Intel’s HD 630 GT2 graphics as the traditional ‘integrated’ low power graphics (iGPU) for video playback and QuickSync. This is connected via eight PCIe 3.0 lanes to the ‘package’ graphics (pGPU) chip, the Radeon RX Vega M, leaving 8 PCIe 3.0 lanes from the CPU to use for other functionality (GPU, FPGA, RAID controller, Thunderbolt 3, 10 Gigabit Ethernet). On the Radeon RX Vega M graphics, there is one version of the silicon for which there will be two variants: the ‘GH’ will be the highest part (H for high) with 24 compute units (1536 streaming processors), 64 pixels per clock, running at a base frequency of 1063 MHz and can boost up to 1190 MHz. The second variant is the GL part (L for low), with 20 compute units (1280 streaming processors), 32 pixels per clock, running at a base frequency of 931 MHz and can boost up to 1011 MHz. Both pGPU Radeon variants will have access to 4GB of HBM2 as an immediate graphics memory (this is not available to the CPU as DRAM). With one stack of HBM2, this means a 1024-bit bus width, which for the GH parts runs at 800 MHz for 208.6 GB/s bandwidth, or for the GL parts runs at 700 MHz for 179.6 GB/s bandwidth. Intel likes to stress that this bandwidth is only possible due to its EMIB technology, as currently all non-Intel HBM2 products available require an expensive bulky interposer that adds z-height: by using EMIB, Intel claims, the performance is on par with an interposer without the added bulk or most of the cost. Only the Core i7-8809G, the highest placed processor, will offer overclocking. Intel has defined this chip as able to overclock the processor core, the integrated graphics frequency, the package graphics frequency, and the high bandwidth memory frequency (as well as system level DRAM). Overclocking will be dependent on how the vendor implements the feature set and software: nominally Intel is stating that in Windows 10, the CPU/iGPU can be overclocked through Intel XTU software, while the pGPU and HBM2 will need AMD’s Radeon Wattman software. It is not clear if/when an Intel-specific version of the latter will be distributed, given that when asked where the driver/software stack for the Radeon graphics should come from, we were told ‘all the software will come from Intel, consider this a fully-enabled Intel processor’. We confirmed with Intel that all the processors support VT-x and VT-d, and that none of the processors support ECC. Only the i7-8706G is vPro enabled. Where do they claim that it will beat the GTX 1050 in terms of power efficiency? They show some select benchmarks that imply a certain efficiency in those specific cases, but I didn't see that they mentioned general power efficiency or price at all. This package from Intel does have HBM, which is more power efficient than GDDR5. That will help. But overall, my expectation is that Intel's new chip will be less efficient in graphics intensive tasks than a system with a latest generation discrete NVIDIA GPU. The dynamic tuning should help in cases where both CPU and GPU need to draw significant power, though. We probably know how Vega performs. Assuming that the chips aren't TDP constrained, the more powerful of the two variants should probably perform somewhere between a 560 and 570 in games. The lesser variant should perform around a 560, less or more depending on how memory bandwidth plays into things. We'll have to see how power constraints factor into to things though.